My name is Dave King and my wife and I moved to Cardiff from Surrey in the summer of 2008. As I had been involved for several years in volunteering, primarily on conservation projects with organisations such as the RSPB, and thoroughly enjoyed it, I was keen once here to do something along similar lines. 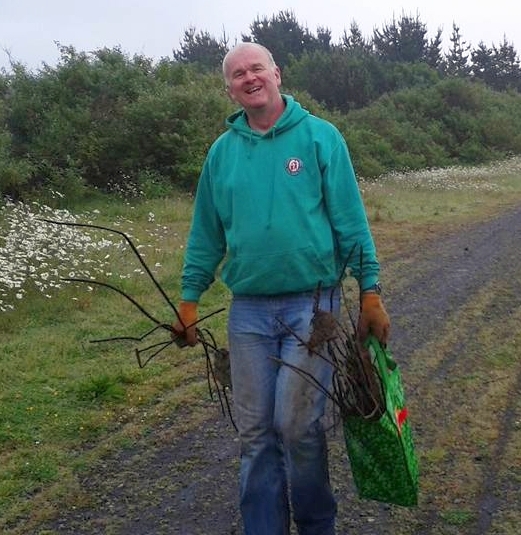 I looked at few options but what appealed most was the work that Keep Wales Tidy (KWT), and what the Tidy Towns project in particular, was trying to achieve in and around Cardiff. I therefore contacted KWT to see if there was anything I could help with and met up with Indeg Jones Project Officer for Cardiff for a coffee and a chat. 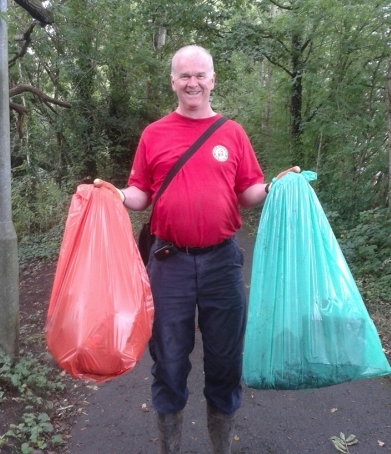 Through Indeg I have participated both during the week and at weekends in a number of multi-action days with the police, park rangers, and council enforcement teams clearing rubbish in residential areas around Cardiff. 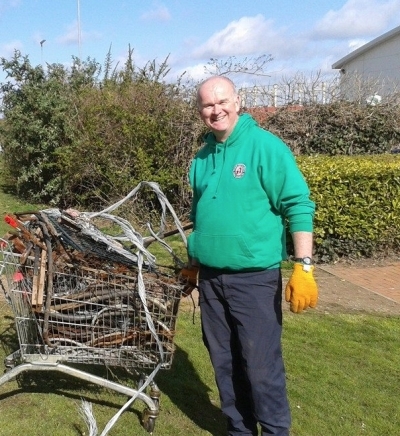 These included community days with ‘Friends of Ely Gardens’ and ‘Friends of the Crystals’ tackling fly tipping that has been going on for years, and most recently a joint effort between Glamorgan Anglers and Tidy Towns to tackle the build up of rubbish upstream from Blackweir on the banks of the River Taff. The whole experience has been great and I have met some excellent people, but it is this last exercise that I have probably enjoyed the most. It has led, with Indeg’s support, to the formation of an organised group, the Cardiff River Group (CRG), to undertake regular clean-ups of the banks of the Taff and support official bodies such as the Environment Agency and others, tackle issues around litter and fly tipping. Although very much in its infancy, there is a core of really friendly, committed individuals who simply want to give something back and make a difference. Our initial efforts really have made a visible difference and we plan to hold regular events from the autumn onwards, not only along the Taff but the Ely as well. It is amazing what a few people can do in just a couple of hours if they put their mind to it. So what next? I am obviously going to be quite busy in setting up and helping organising the CRG but I have also, through Tidy Towns, got involved with the Cardiff Urban Bat Survey (CUBS) to assist with what is likely to be the largest bat survey ever held in South Wales, and in helping the Butterfly Conservation Society with habitat management in the Vale of Glamorgan. Hopefully the CRG will get itself established very shortly and perhaps encourage further groups upstream from Cardiff to get established to help preserve and maintain, what is both a haven for wildlife and a great social resource for South Wales. Would I recommend getting involved? Absolutely! The thing with volunteering is you can do as much or as little as you wish. For me it is a great way of exercising while at the same time actually making a difference. Being able to walk along the river free of litter and rubbish I know improves the quality of life who live or work around the area. Volunteering for me has to be both enjoyable and rewarding, and if it helps me get fit and see some of the great countryside on our doorstep so much the better. But perhaps the best thing is that you will meet like-minded, friendly people who not only want to do something positive but have fun doing it!